This palm tree will make a great addition to any home, office or landscape. It will give a sense of the tropics with little cost. Its time to go green and buy real palm trees. Palm trees are also great for indoors because they act as a natural humidifier and detoxifies by removing Carbon Monoxide and replacing the air with fresh Oxygen. Real Palm Trees make a home feel like home by giving you the feel of nature inside or out. Buy this palm tree and have a piece of unspoiled nature. Though it can be cold-sensitive, this palm is an outstanding accent palm for tropical garden beds or sheltered entry areas. Its small size and striking appearance enhance formal or eclectic landscapes. The fronds are few but long and graceful. Most often seen as a single specimens, bottle palms are also available as novel, eye-catching multi-trunk specimens, usually with 2 or 3 trunks. 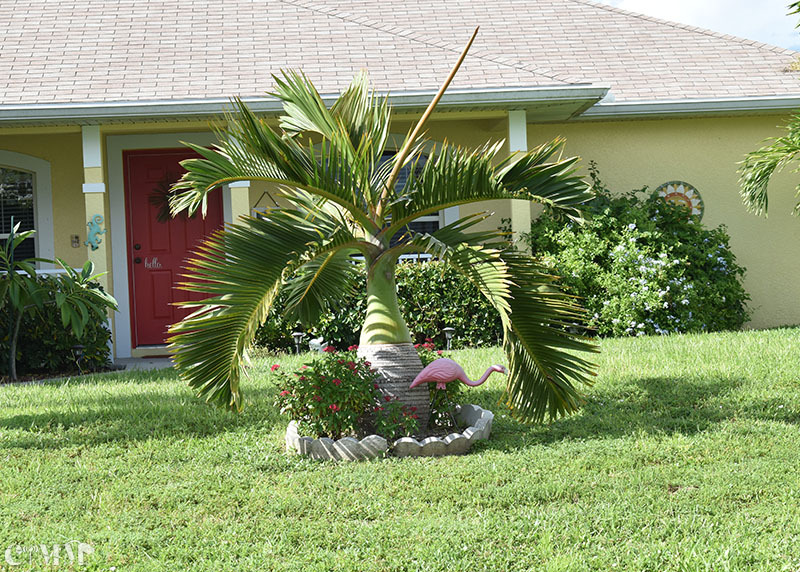 Contrary to popular belief, the swollen trunk of this mini palm tree is not for water storage. Though it can be moderately drought-tolerant once it's established, this palm does need regular irrigation during dry spells. Plant Specs: Bottles are slow growing palms that could end up about 10 feet at maturity but maturity takes many years. Most specimens in the landscape average only 5 to 7 feet tall. Bottles are drought-tolerant and like full to part sun locations. They can be used in partial shade as well, but if there's too much shade the crown shaft will grow elongated and lean toward the light. Plant Care: Plant in an area where the soil drains well, like a beach environment. This palm does not like an overly wet area. Add top soil to the hole when you plant. Bottles aren't self-cleaning but, due to their slow growth rate, you'll rarely have to trim off an old frond. For cold protection, tie up the fronds and wrap the entire head of the palm with frost cloth or a thick blanket.